Sweet potatoes are not only delicious, they are also very beneficial to our health and make a great side. Preheat oven to 200°F or 400°F. Rinse and scrub the potatoes and cut them in half, length wise. 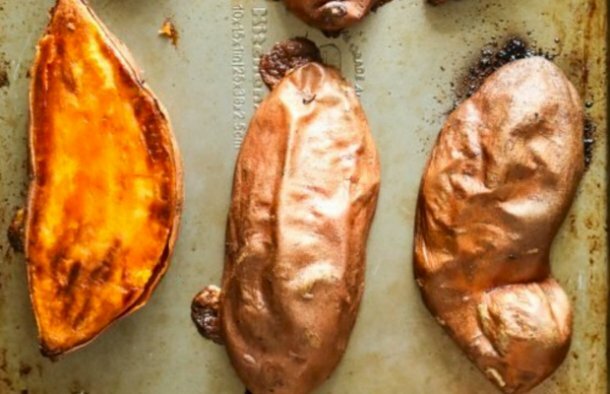 Rub the sweet potatoes on both sides with olive oil and sprinkle with salt and pepper. Place the potato halves face down on the baking sheet. Bake for about 30 minutes or until the potatoes are tender. 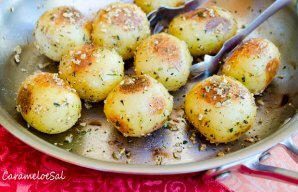 These Portuguese fried potatoes with garlic and rosemary (batatinhas fritas com alho e alecrim) make the perfect side dish. 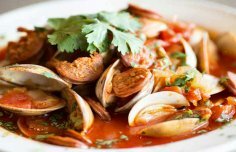 How to make Portuguese spicy clams with chouriço and tomatoes.